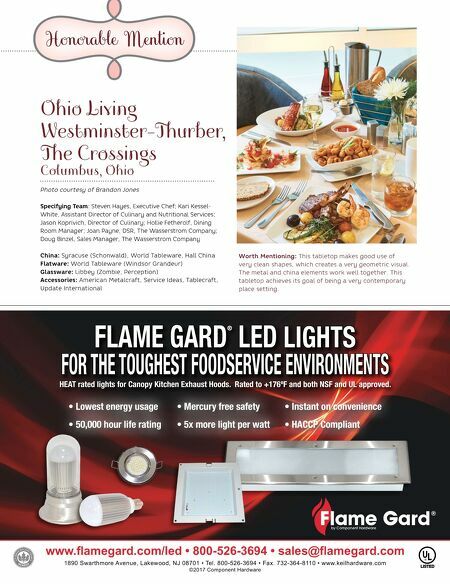 FLAME GARD ® LED LIGHTS FOR THE TOUGHEST FOODSERVICE ENVIRONMENTS HEAT rated lights for Canopy Kitchen Exhaust Hoods. Rated to +176ºF and both NSF and UL approved. • Lowest energy usage • Mercury free safety • Instant on convenience • 50,000 hour life rating • 5x more light per watt • HACCP Compliant 1890 Swarthmore Avenue, Lakewood, NJ 08701 • Tel. 800-526-3694 • Fax. 732-364-8110 • www.keilhardware.com ©2017 Component Hardware www.flamegard.com/led • 800-526-3694 • sales@flamegard.com ¨ LISTED by Component Hardware Ohio Living Westminster-urber, e Crossings Cumbus, Ohio Hae Menti Photo courtesy of Brandon Jones Specifying Team: Steven Hayes, Executive Chef; Kari Kessel- White, Assistant Director of Culinary and Nutritional Services; Jason Koprivich, Director of Culinary; Hollie Fetherolf, Dining Room Manager ; Joan Payne, DSR, The Wasserstrom Company; Doug Binzel, Sales Manager, The Wasserstrom Company China: Syracuse (Schonwald), World Tableware, Hall China Flatware: World Tableware (Windsor Grandeur) Glassware: Libbey (Zombie, Perception) Accessories: American Metalcraft, Service Ideas, Tablecraft, Update International Worth Mentioning: This tabletop makes good use of very clean shapes, which creates a very geometric visual. The metal and china elements work well together. 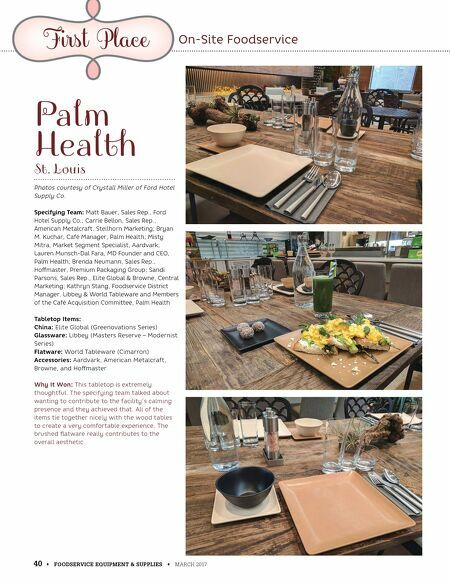 This tabletop achieves its goal of being a very contemporary place setting.